Today’s prompt is : Write up a mid-year “State of My Year” post. I can’t believe that seven months are already over! It seems like its only been a week or two since I celebrated New Year. I have some good days and some bad days mixed with that where some great days and some terrible ones. I’ll write down month by month the things that happened( Only those worth mentioning, so you wont get bored). January : Got news that I passed a national level exam(Lets call this Exam No.1) and got selected for the interview round. That was the best news of the month as far as I can remember because this was the first time I gave such an exam and to pass it with good marks felt really great. February : Most of this month went in studies for another exam. This one was to get selected to a University to get my Master’s Degree. March : Gave the interview, which went okay. I was able to answer most of the things properly. This was only the second interview I’ve given in my whole life and it was way better than the first one. April : Celebrated my birthday with family and then again with friends, got news that I cleared the interview and the selection exam of the university. This was probably the best month this year because I kept getting something to be happy for, almost every week. May : Nothing worth mentioning happened. Just roamed around, studied,had a good time and gave another exam(lets call it Exam No.2). 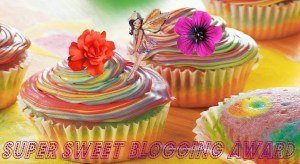 June : Started this blog!! That was the best part of the month. The worst part – Got two real nasty news that even though I cleared my interview my marks where two points lower than the limit set by them to select who gets a job and I didn’t even clear Exam no.2. July : Another good month. Blogging, going out with friends, spending time with family, reading, watching movies and eating good food – that sums this month. That’s my year so far. I’ll probably spent most of August reading. My uncle came over for a visit last week and knowing how much of a bookworm I am brought lots of books for me to read. Will have to wait and see what the next five months hold for me. For this week’s Photo Challenge the topic is Companionable. The first thing that comes to mind when I hear that are books. They have always been a there for me. When I had no friends, during tough times in my life or simply when I wanted to lay back and relax. I picked few books by some of my favorites authors to keep in the background. My bookshelf is not in a condition to be photographed right now. Will clean it up and post some photos in the future. I’ll try my best to keep it spoiler free. I don’t plan on giving away any major points of the plot so you can continue reading. 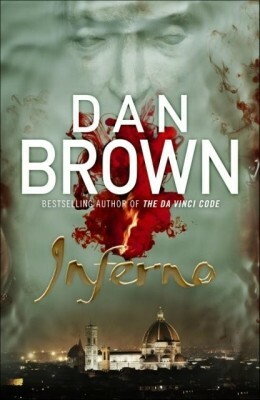 Just like the rest of the novels featuring Robert Langdon, this too is set as a race against time where he has to follow clues to find out where to go next.Compared to the other novels this one has a slower pace and less drama/action so that was a little disappointing but just like the other novels it is not at all boring. The novel is based around Dante Alighieri and his work Divine Comedy. There are no secret societies or cults in this book, which is what we usually associate with Dan Brown’s novels. Instead it revolves around science. The antagonist in the novel is geneticist and Dante fanatic named Bertrand Zobrist who proclaims to have found a solution to solve the problem of over population by drawing inspiration from the Black Death. Robert Langdon wakes up in Florence with no memory of last two days of his life. He is saved from an assassin by one of the doctors Sienna Brooks and finds out that the first clue to finding out answers as to what is going on is hidden in a container with a bio-hazard symbol. The novel has Brown’s usual plot characteristics of involving artists, famous paintings, sculptures and buildings of architectural significance, along with Langdon having a female side-kick who helps him while the novel unfurls and they travel from a country to next following clues. I can’t write much without giving out the plot or any key points hence the short outline in this post. I consider this book worth reading. If you liked his previous novels you will like this one too. This book was published in 2007, many of you might have already read it and with the movie releasing this year many more will be interested in reading the series if they haven’t read it yet. 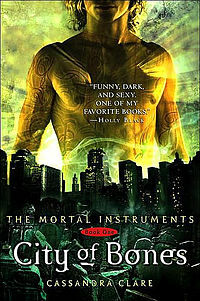 City of Bones is the first book in the The Mortal Instruments series written by Cassandra Clare. It is a young adult, fantasy novel dealing with demons and demon hunters. To tell the truth I wasn’t that interested in reading the book but being me I wanted to give it a try before watching the movie. For those whose like this genre it will be a great book and for the others not so much. I found some parts interesting and others plain boring.The author has really good imagination, that’s for sure. The theme is that of another world hidden in plain view in our own much like Harry Potter. There are Warlocks, vampires, werewolves,magic,demons and demon hunters ( known as Shadow Hunters who are part human ,part angels), living in our own world without us even knowing. The name for normal human beings is mundanes. This too seems like an idea drawn from Harry Potter, remember the word “muggles”, right? The similarities end here, the plot is entirely different. It is another good vs. evil story but plot for each one is different right so not counting it a s a similarity. The novel follows Clary Fray, a fifteen year old who gets involved in the world of Shadow hunters. While out in a club with a friend she seems a trio killing what she believes to be a human. The trio turn to be Shadow hunters, who are not supposed to be visible to normal humans but her being able to see them raises the curiosity of one of the Shadowhunters named Jace. Later Clary finds out that her mother has disappeared and is attacked by a demon. The rest of the story is about Clary learning more about the other world and she finds out that her family and past may not be the way she actually thought it to be. There is more in the story than this. So it’s not exactly a spoiler. There is suspense, a little action and twists(one twist in particular is a really unexpected),those are the parts I liked about the novel. The movie might be better than the book because I think it’s one of those story which would have more effect when seen and not read. The trailer looks promising, I’m hoping it will live up to the hype. 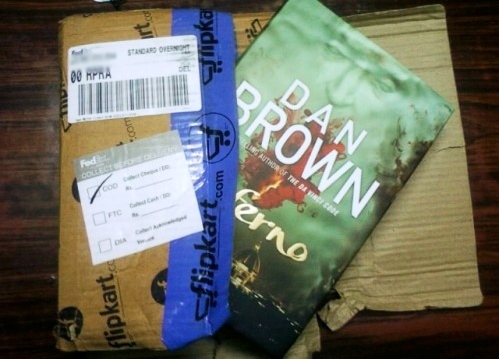 Only bookworms will understand the joy of having a new book in hand. The fresh pages, that scent of new books and lines and lines of story waiting to unfurl before your eyes. 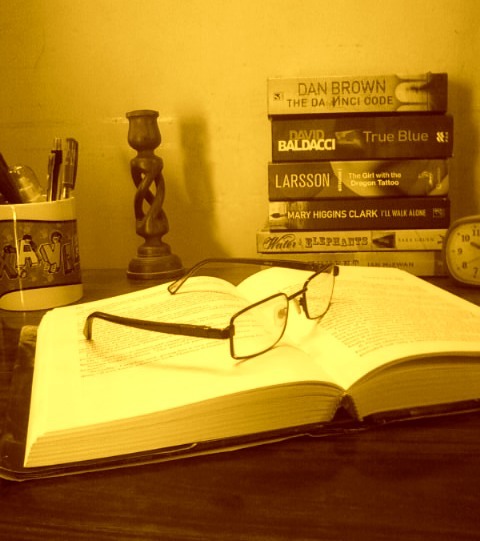 There are only a few authors who write good books one after the other. I certainly think Dan Brown is one of them. I received the book today. I thought I’ll have to wait two three months more to buy the book. The list price is too high right now since it was released just last month. Well, the list price is too high for me, as my funds are running low. Lucky for me,I got a good discount and placed the order immediately, otherwise I would have spent too much time thinking whether I should buy it now or not. It sounds like a children’s book when you first read the title but I believe anyone of any age can read it. The book is the debut novel by Ransom Riggs and is entertaining and will keep you interested till the end. I wouldn’t call it mind blowing but you wont feel like it’s a waste of your time and is worth reading. The author has done good job in creating a story from random vintage photos in his collection. The photos play a big hand in making this novel a good one. Eerie shots of kids have been used to give the story a supernatural element. 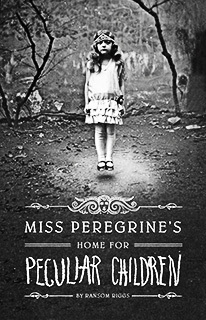 The story is about 16-year-old Jacob Portman who grows up listening to stories from his grandfather who tells him about growing up in an orphanage full of peculiar children with strange powers. Jacob has no real friends and has nothing much to look forward to in his life.He forms a special connection with his grandfather through the stories but as he grows up Jacob regards the stories as just that – stories, that which his grandfather made up. His grandfather’s sudden death under mysterious circumstances lead him to follow his grandfather’s last words to go the island and find the orphanage. Jacob arrives at Cairnholm, the island where the orphanage is to find out whether Miss Peregrine is still alive. At first he thinks that the orphanage is abandoned, which is what everyone on the island believes, but later finds out that things are much more peculiar and that there was more truth in his grandfather’s stories than he could have ever imagined. It’s not exactly a horror novel but more of a mystery created around a supernatural base. The characters are good and he story well laid out.You wont be left feeling like it’s dragging on. I enjoyed reading and you might as well. Even if you don’t read the book, you can see some of the photos used in the book here. And here is a trailer of the book.